I simply could not resist the perfectly pink grapefruits at the market this week. A favorite breakfast of mine is a piece of toast, half a grapefruit with a little honey, & a cup of tea. I figured I could stretch my luscious fruit find into a lovely cocktail as well. The Greyhound is a breeze to put together & the fresh squeezed juice makes it feel oh-so Summer-y. 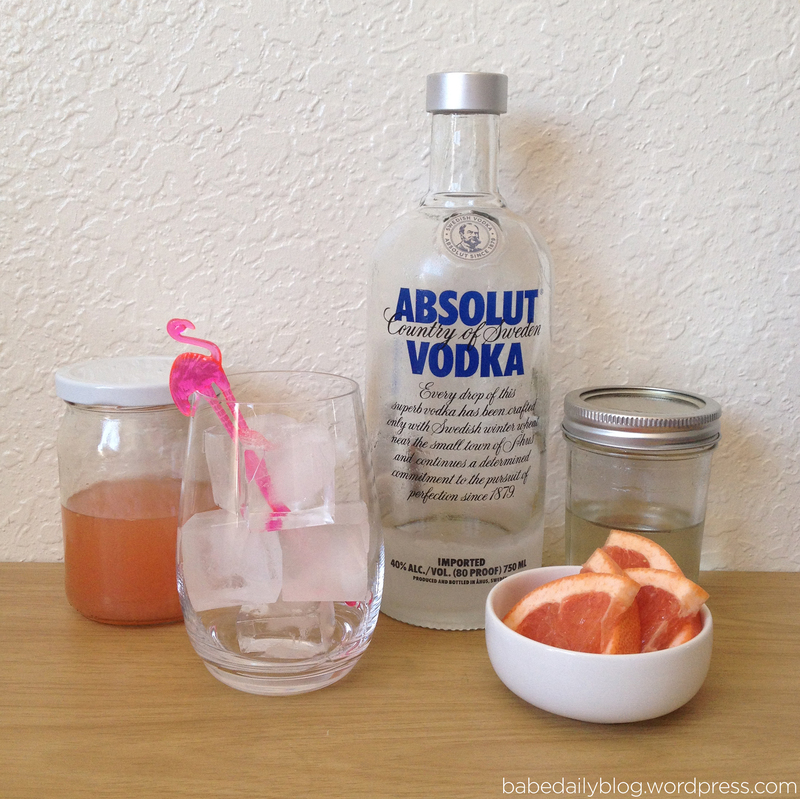 Into your glass, pour in the vodka, grapefruit juice, & simple syrup. Stir well until everything is combined. 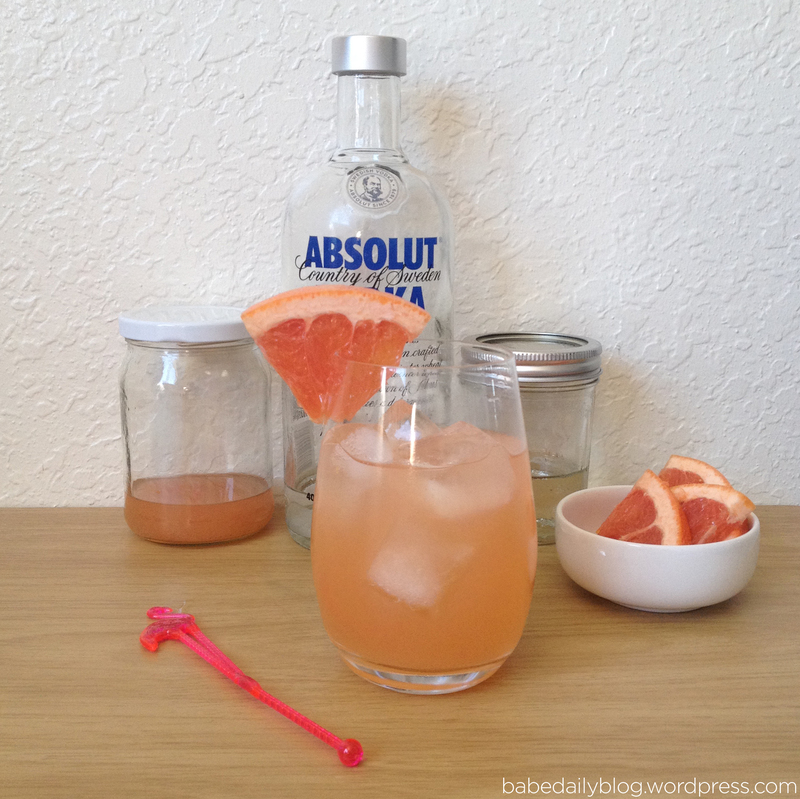 Pop a wedge of grapefruit on the rim to garnish & get to sipping! What fruits do you go to for cocktail inspiration? 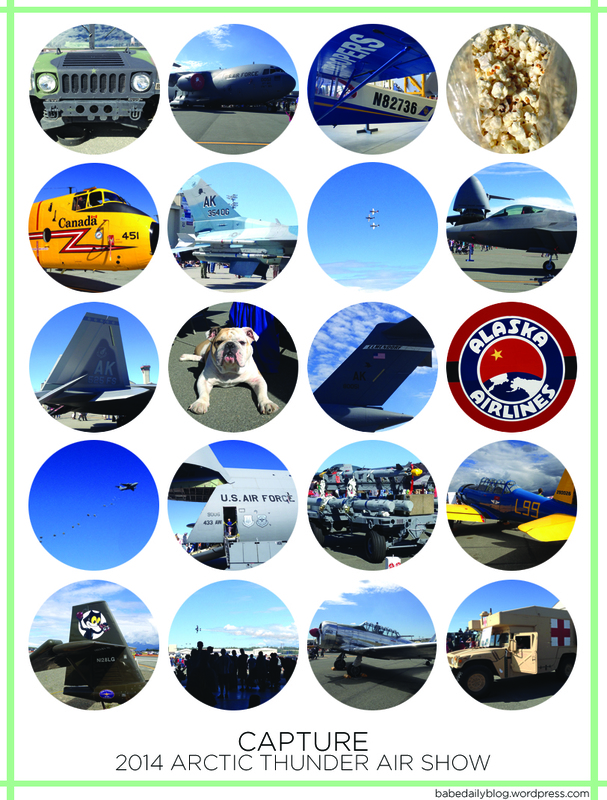 This weekend I attended the 2014 Arctic Thunder Air Show at Joint Base Elmendorf- Richardson. Here’s a look at what I saw. It was a perfect day to walk about, eat kettle corn, & see some sweet planes. What did you babes get into this weekend? Happy Monday Babes! I trust you all enjoyed your weekend (I sure did). Here’s what I’m making this week. Because my boo’s family was in town this weekend, we didn’t have a chance to shop Sunday as we normally do. Since we’ll be shopping tonight, I’m making a quick & easy dinner. I’ll toss cooked, packaged cheese ravioli with peas & a few tablespoons of butter. Then top with grated parmesan & serve alongside a green salad. Simple & delicious. This slow cooker recipe is great. I like to serve it over jasmine rice with warm naan. My boo is all about wraps, so I’ll be rolling up some chicken, parmesan, & romaine topped with this dressing in a whole wheat wrap. I’ll make this recipe for the gyros & this recipe for the salad. 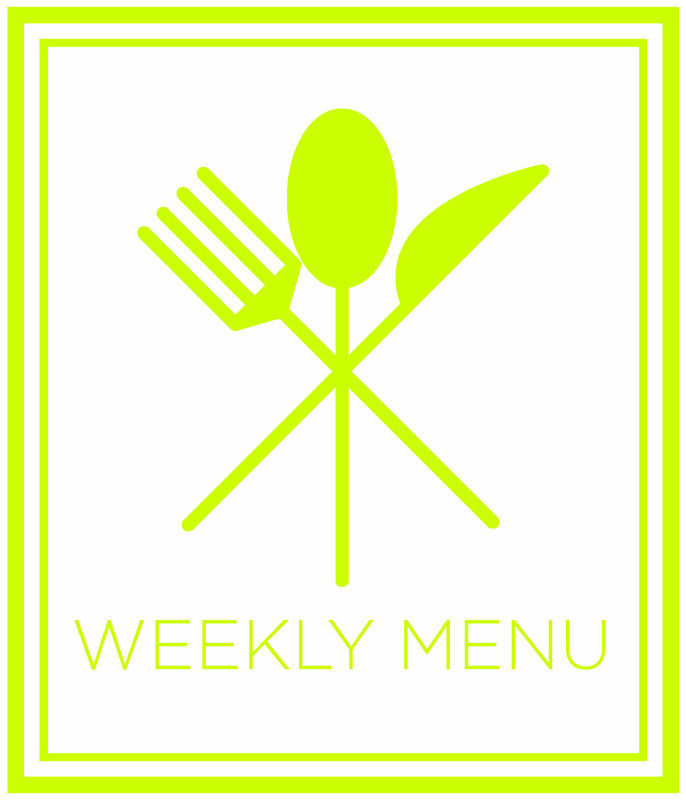 Friday– Chicken w/ rice & veg. A classic go-to. I’ll season the chicken with poultry seasoning & serve it over rice pilaf with sautéed carrots & zucchini. I’ll brown a pound of ground beef seasoned with salt & then drain the fat. Then I’ll sauté half an onion, 2 bell peppers, & a clove of garlic in a bit of olive oil. I’ll dump that into the slow cooker along with one can each pinto, kidney, black, & chili beans. 8 oz of tomato sauce & one diced jalapeño go in as well. To season, I’ll add ½ tsp ground oregano, ½ tbsp ground cumin, 1 tbsp chili powder, a tiny pinch of cayenne, & a pinch of salt. Check the seasoning half way through & adjust as needed. Cooked on low, this chili is perfection in 4 hours. I serve it up with sour cream, cheddar, & Fritos. An ice cream truck staple you can make at home! 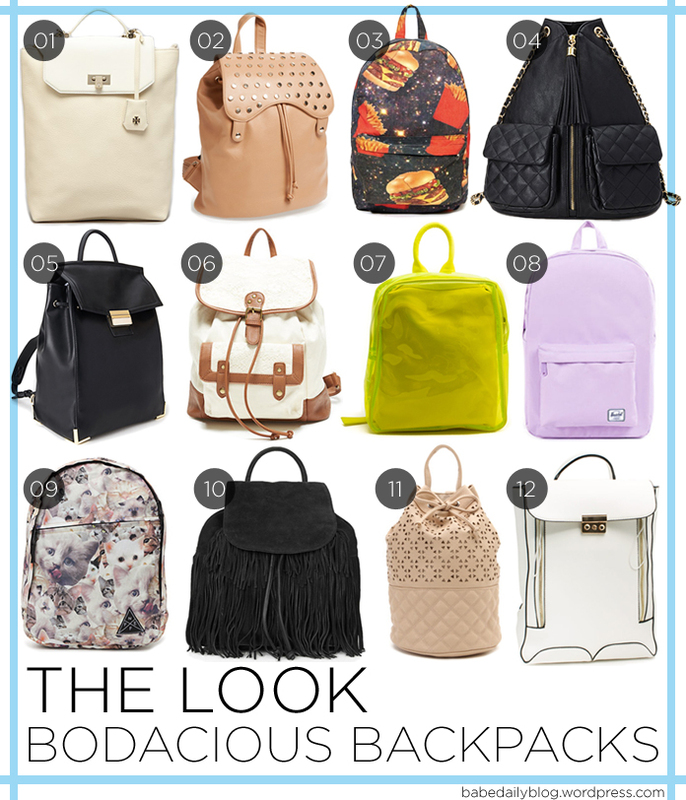 With the school year looming, I thought backpacks were an apropos post topic. Plus I can’t hop on social media without seeing some babe toting a new pack. Personally, I only like a backpack for hiking or day trips. I feel naked without a bag on my arm & the straps don’t cut it. But some of these pieces are so alluring I may trade in my top handles for a backpack. Let’s take a look at some fab options. I’m sure you’ve already noticed that I’m a babe that loves festivities. Any reason to celebrate & decorate, and I’m on it! Because my boo is returning home from his motorcycle trip (along with his family), I thought I’d share with you a sign I made to welcome them. 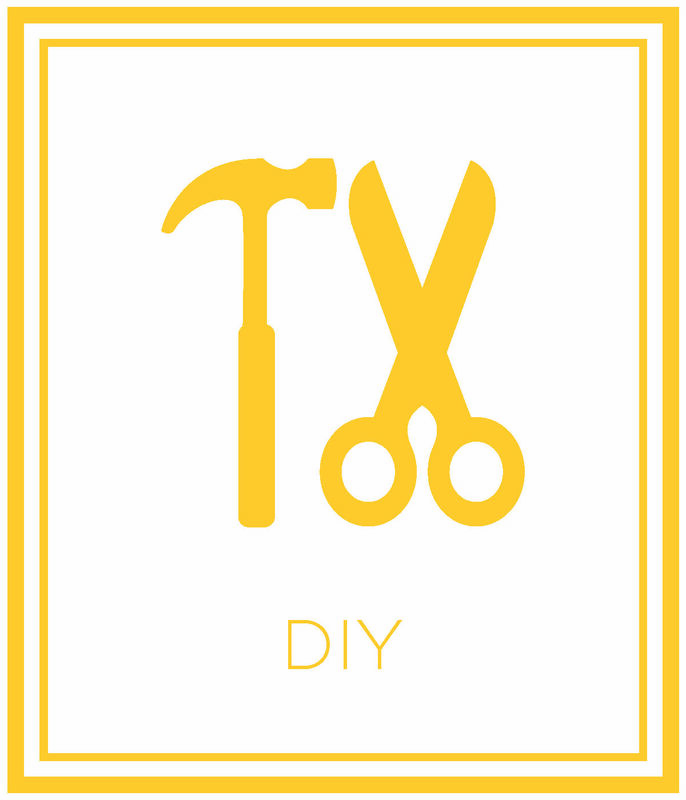 So print out that transfer & get your smock on because it DIY time! Let’s start off by measuring out our sign. 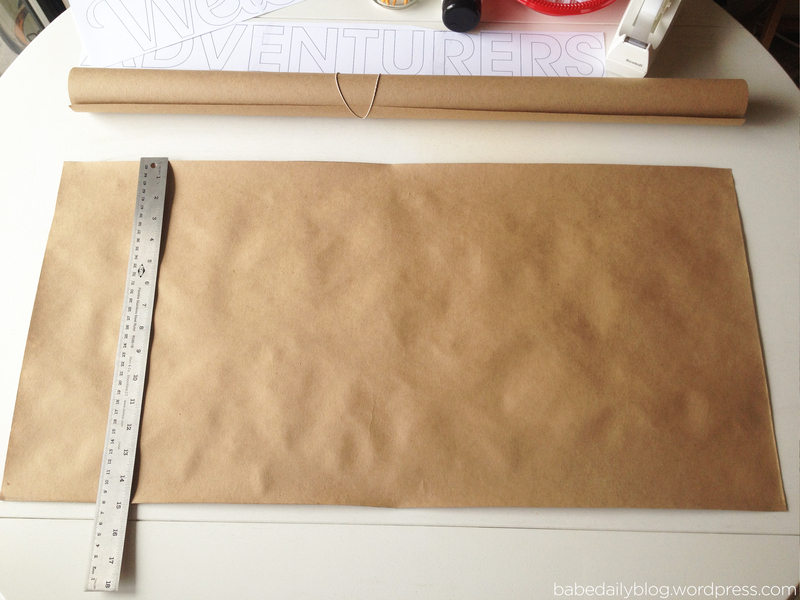 My Kraft Paper roll is 30″, which made the perfect length, so I cut my sign at 15″ high. 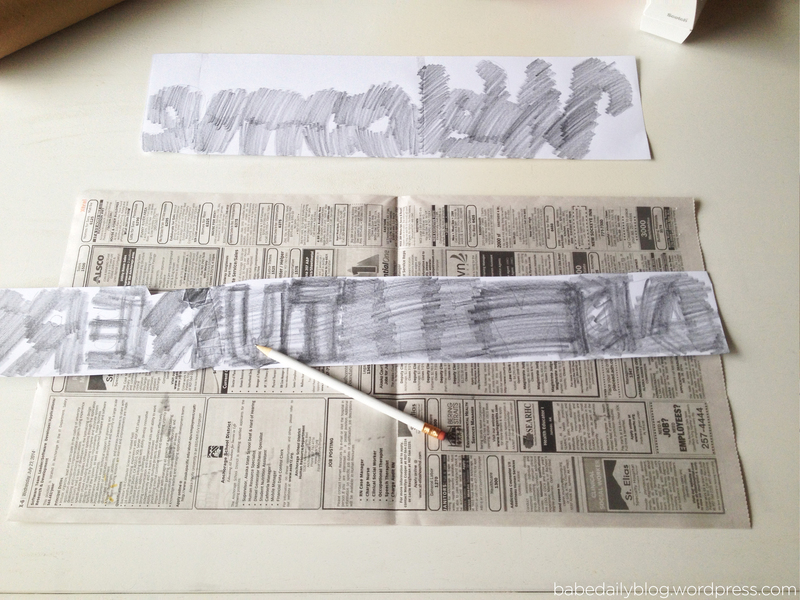 Next you’ll want to cover the back of your transfer text with pencil. 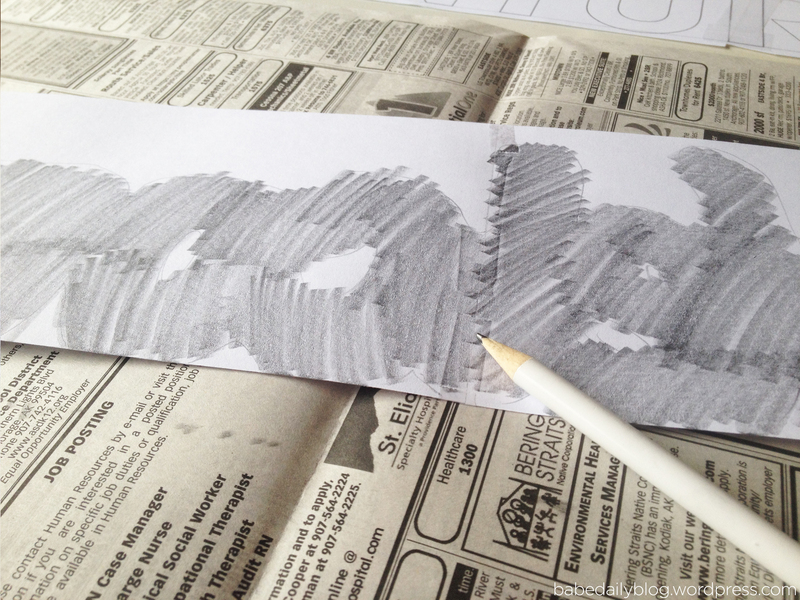 I like to do this over newspaper for a softer surface. 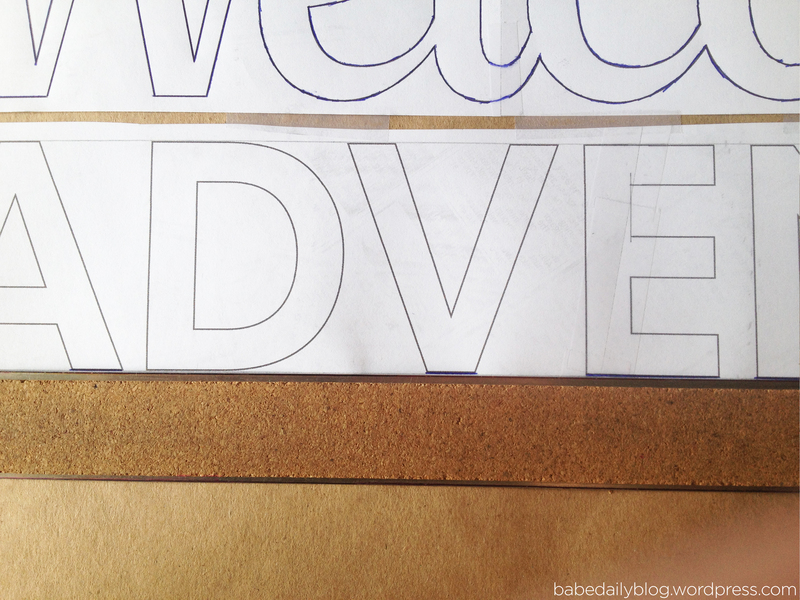 Make sure there’s graphite covering the back of all areas where there’s text. Now, place the transfer texts on your sign & align them how you please. 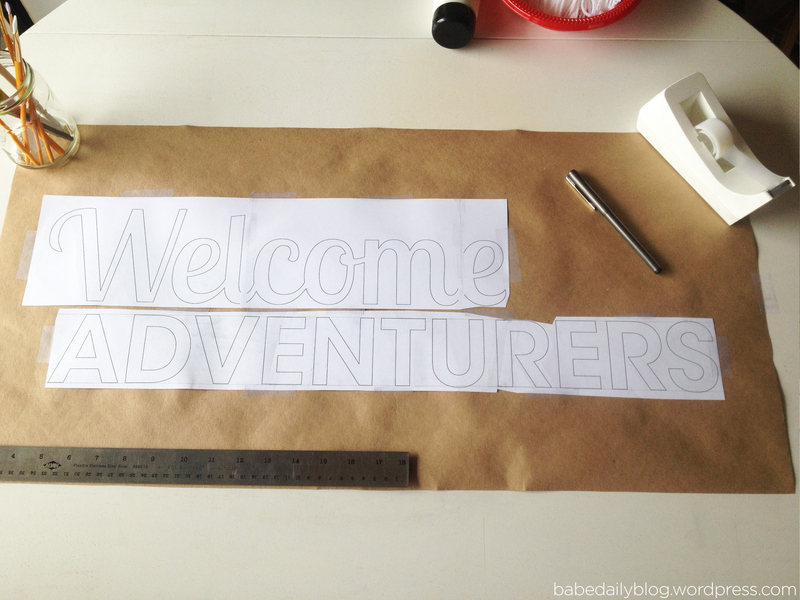 When you’re happy with the layout, gently tape down the transfer papers to the sign. 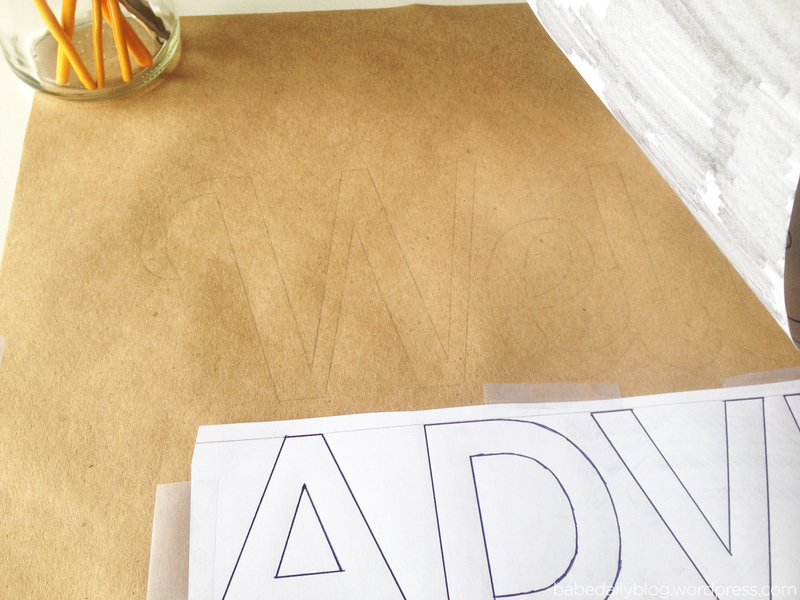 In order to transfer the graphite from the back of the papers to the Kraft Paper sign, you have to trace over the text. I find it helps to use a colored pen for this so you can see where you’ve drawn. 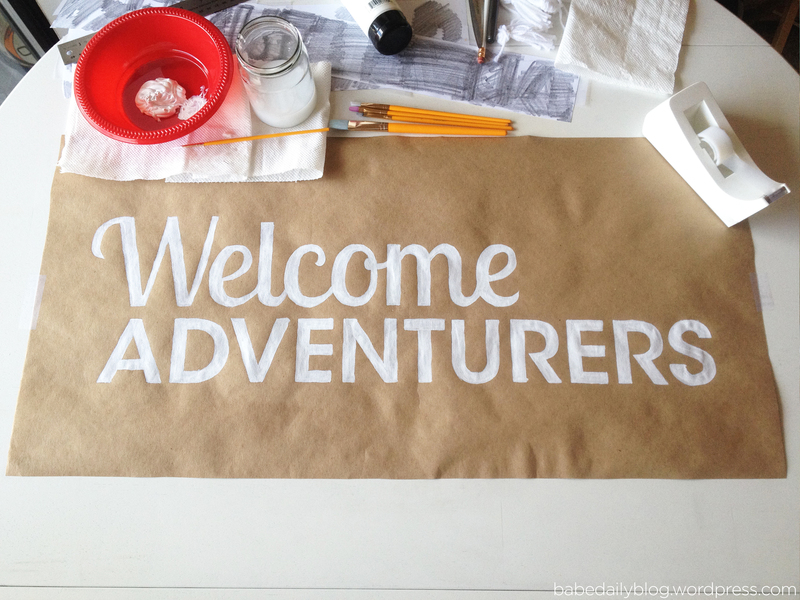 Make sure to use a straight edge for all the straight lines of the letters. Another helpful tip is to line up your straight edge with the bottom of all the letters & then do all the baselines at once, then do the same for the top. Once you’ve finished going over all the letters, un-tape one side of the transfer paper & have a peek underneath to make sure all the necessary lines transferred. If you’re missing a line, make sure there’s graphite on that place on the paper, tape the paper back down & go over the spot again. 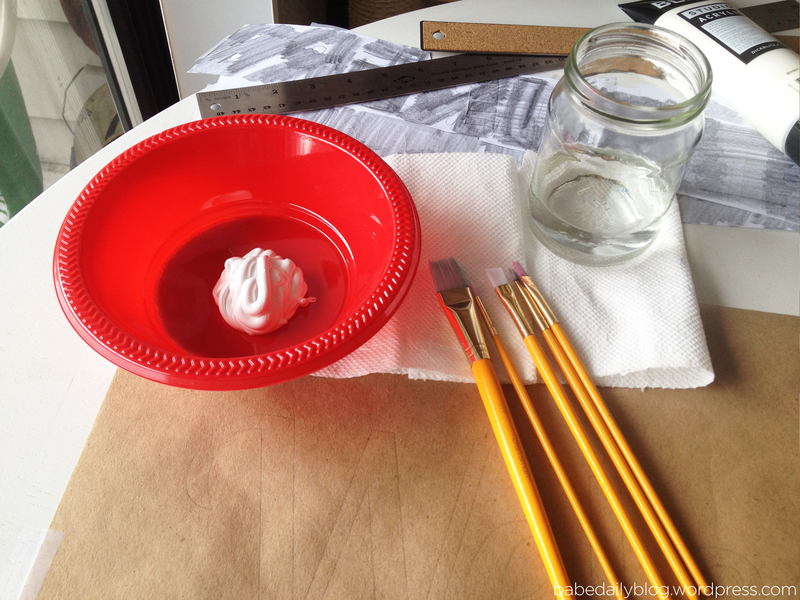 When everything looks ok, it is time to paint! 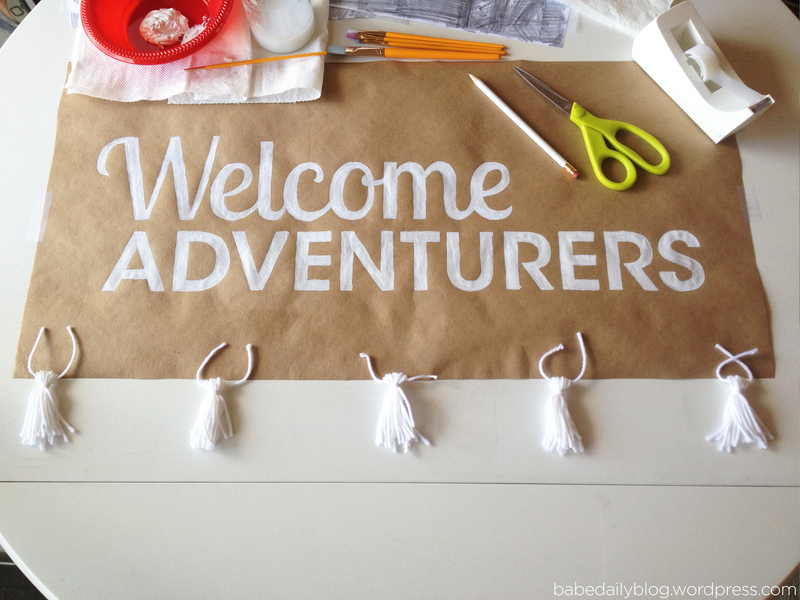 Plop out some white paint & get to work. 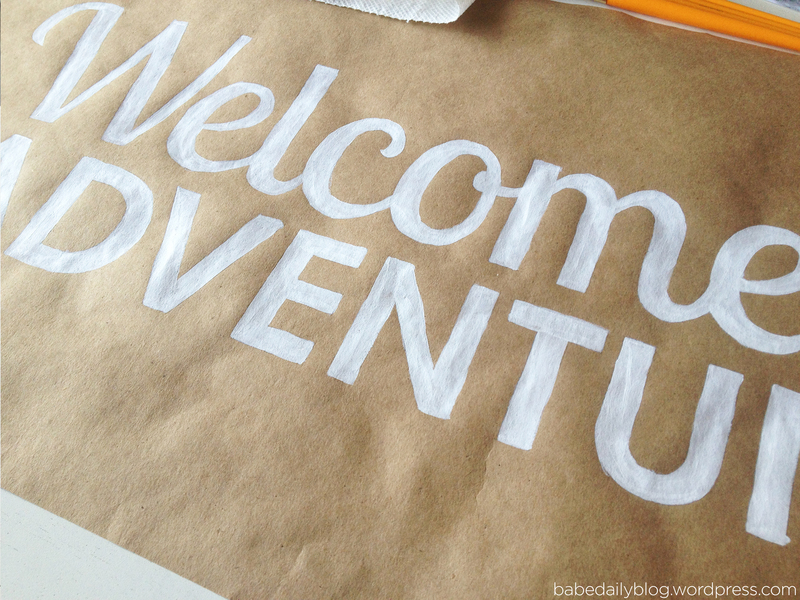 I like to use a very small brush to get into all the small spaces on the letters. 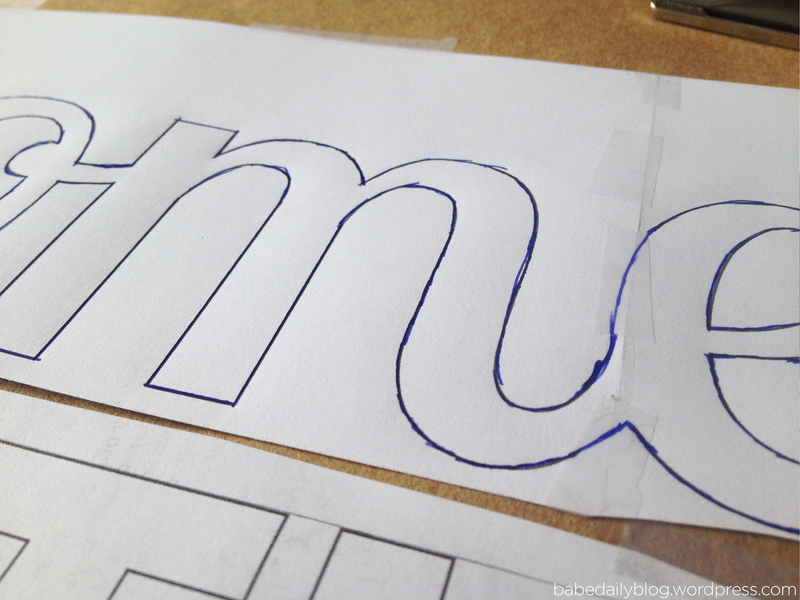 Also, adding a bit of water to the paint helps to smoothly paint the outlines of the letters. This step is the most time-consuming, so crank up the tunes & zone out. Keep in mind, this isn’t something people will be up close & personal with. If you paint outside the lines a bit, it’s perfectly fine. From far away, it’ll still look swell. Just take your time with it. If you’re opting out of the tassels, then give yourself a pat on the back because you’re finished! 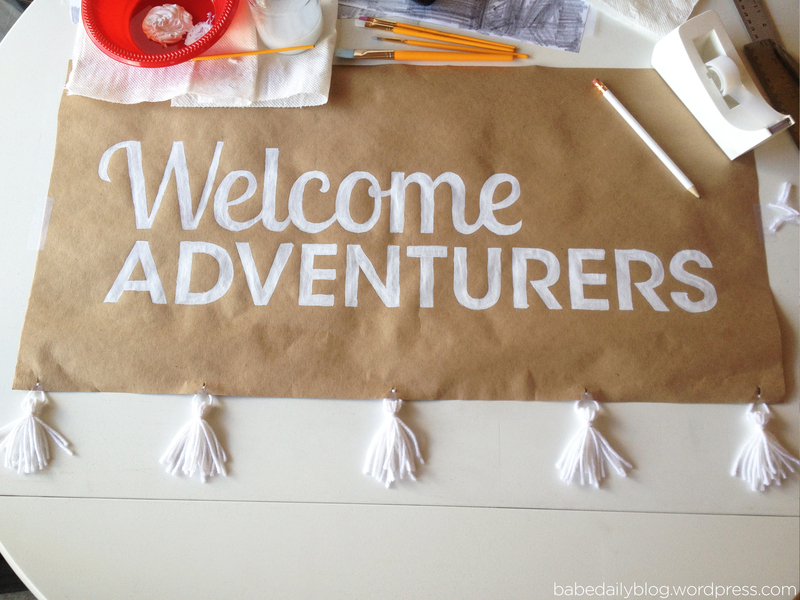 If you’d like to embellish the sign with tassels, take a break now while the paint dries & add the tassels later. Alright my tassel-adders, let’s layout where we’d like our embellishments. Now cut two slits where each tassel will hang. 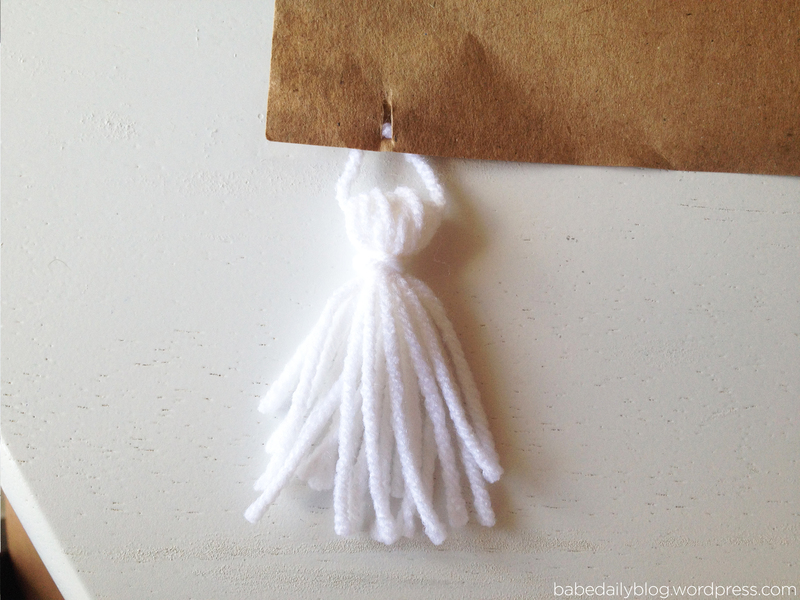 This will create a loop you can thread your tassel onto. 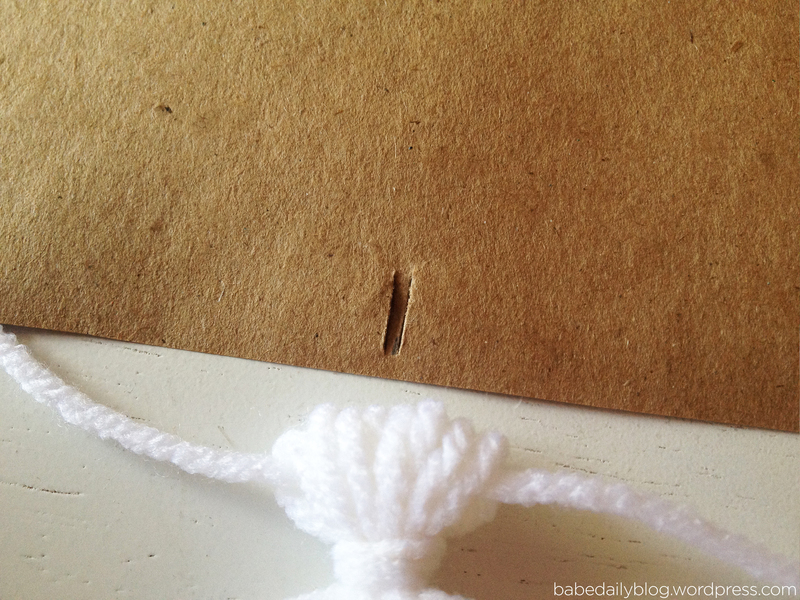 Slide the yarn through the loop you created on the back of the paper, & knot the ends of the yarn together. Here’s how it should look from the front. 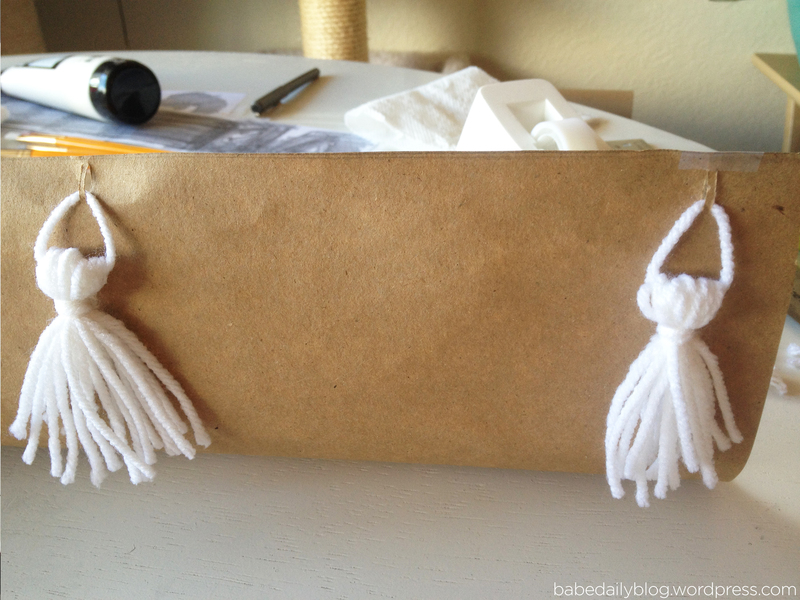 Continue on until all tassels are adorned & you’re ready to display your handiwork! 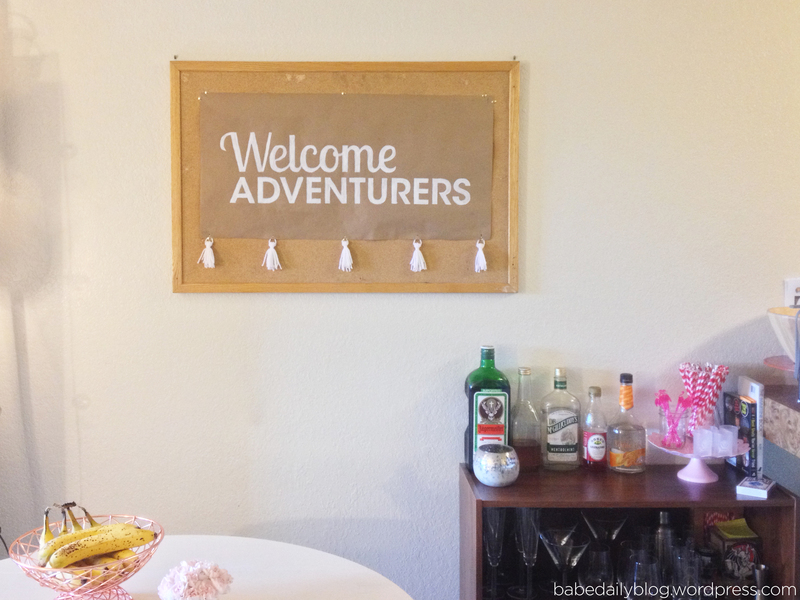 I tacked my sign to a cork board in my dining nook (don’t judge the ginormous Jager), but this sign would be adorable anywhere you display it. If you’ve followed along, let me know in the comments how it went for you! What festivities get you jazzed to celebrate? I don’t like to play favorites (yes, I do), but if I had to choose a fave cocktail, the margarita would be going home a winner. It’s got all the right elements, I think, a cocktail should bear. Not overly sweet, bright & refreshing, and, most importantly, it’s got a serious kick. I’ve closed out the year with margaritas. I’ve celebrated a beautiful summer day with margaritas (& my even more beautiful BFF). I like margaritas so much, my first (legal) drink was a margarita from Chipotle. I’ll never forget that first taste of the perfection that is eating Mexican food & drinking tequila. So babes, it would behoove you to have a good-sized lunch to soak up all the impending tequila, because tonight we’re having margaritas! 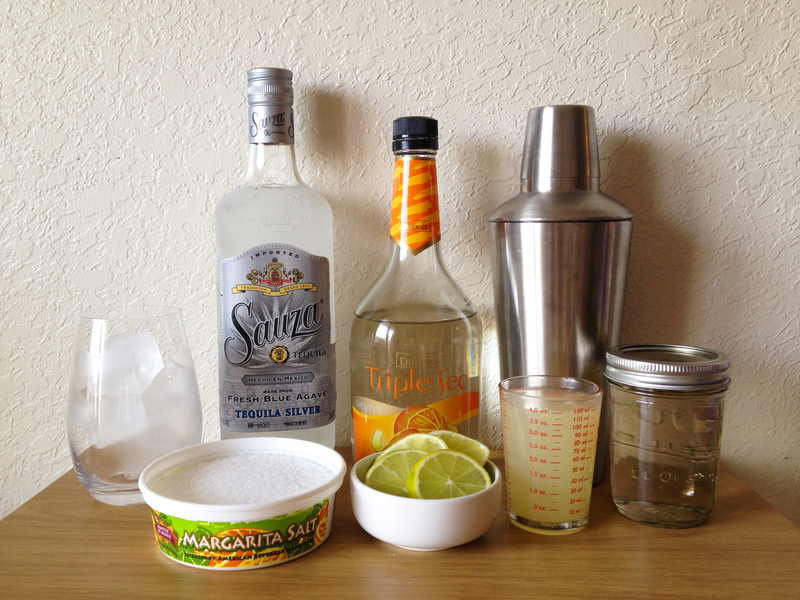 Prep your glass(s) by rubbing the rim with a lime wedge then dipping the glass in salt. Then, fill your glass with ice. Into the shaker, pour the lime juice, tequila, orange liqueur, & simple syrup (I missed the shot of the lime juice going in, forgive me). 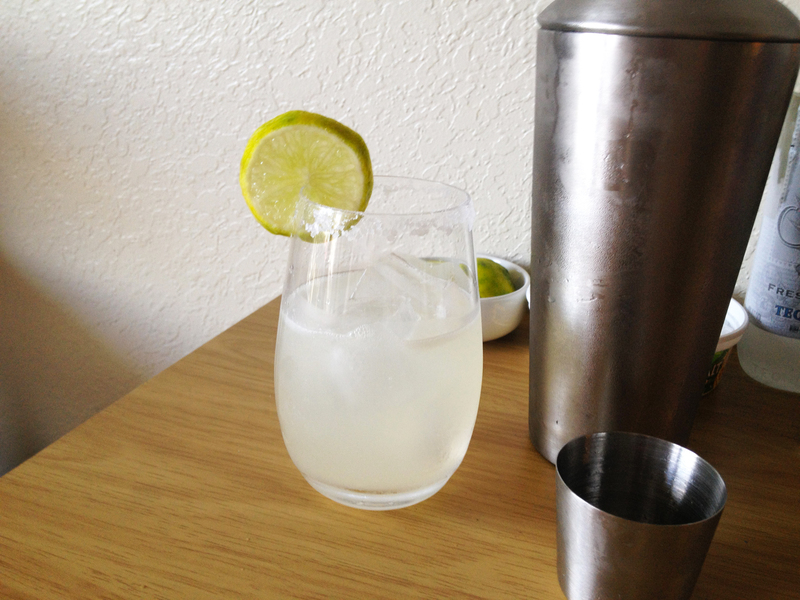 What’s your fondest margarita moment?